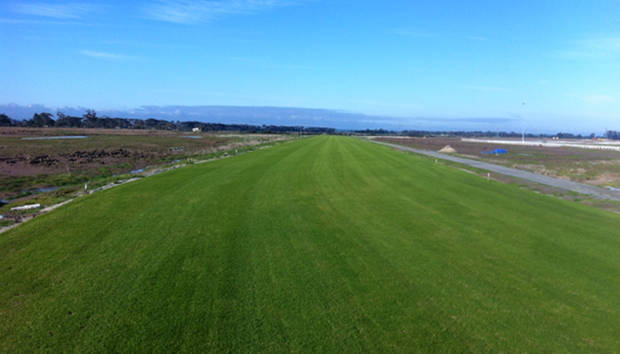 Last year, turfmate went and checked out the site of the new Pakenham Racetrack in Tynong when it was in the earthworks stage of construction. 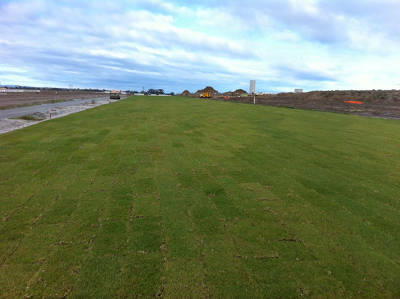 McMahons were responsible for the earthworks and Evergreen Turf is now in the final stages of installing their Evergreen Racing Surface (ERS) which includes a reinforced sand profile and turf. The Project is almost at practical completion and all steps are being taken to ensure The Evergeen Racing Surface (ERS) is one of the most successful race tracks in Australia. We went out and caught up with Bruce Macphee, the Project Manager from Evergreen Turf for the project to check out the impressive progress of the racetrack construction. The racetrack has used 94,000 square metres of Village Green turf, which has all been washed on site. “Washing every roll here on site has been a massive job,” says Bruce. “In the rain, even just the logistics of getting the rolls into the centre where our wash plant is, we couldn’t get trucks in so we’d have to transport everything in on forklifts from a distance of 3km round trip. Evergreen had been involved with this project for more than three years before the construction started and this is the largest project of its type that they have undertaken to date. The ERS is a system that exclusively uses StaLok ® fibres as a reinforcement system. The polypropylene fibres are blended into the top 150mm of sand together with amendments such as fowl manure, lime and turf starter fertiliser. From there, the washed turf goes straight on top of the sand base so that the roots will work their way through the matrix of fibres and it holds the whole surface together. 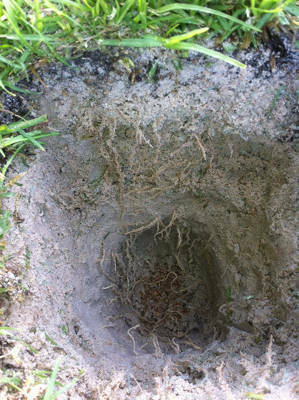 According to Bruce, it is a system that can be used on most turf surfaces. “This is the first entire racing surface using this technology in Australia, similar technology has been used successfully overseas, much trial work has been conducted including small installations on numerous tracks around Australia. Installation of the fibres is completed using a custom built fibre spreader that spreads and incorporates our fibres into the sand in one pass. We are using the latest technology, with a built-in GPS and data logger which allows us to monitor how much fibre is going into the ground at any time. “The advantage of a reinforced profile is increased stability which allows for improved drainage capabilities of the profile. In theory, if they get a massive downpour of rain, racing can continue without any compromise to the racing surface. Bruce says that construction of the 2400 metre circumference track has had its challenges including issues with ground water and the need for stabilisation of the subgrade with lime and cement in areas. At this stage the first race meeting is set for Autumn 2015 .Evergreen will be finished laying the track by the middle of October and then will go into an intensive renovation and maintenance program to get it ready for racing. According to Bruce, this racetrack is the first new racetrack built in Australia in forty years that has been constructed from scratch. The turf used on the track has been supplied by Lilydale Instant Lawnand, Dad & Daves and Southern Pacific Turf in Sydney, who Bruce says have all worked incredibly well with them coordinating deliveries. Evergreen Turf appointed Aquatech Drainage and SJM to do the civil works. All the drainage has been put in using a laser controlled trencher. The Pakenham Racing Club will also be installing a synthetic racing surface, in order to run additional meetings at the site and cater for any meetings that are cancelled due to wet weather. Bruce says that when it is completed, it will be one of the biggest facilities in the southern hemisphere. “We have had two of the most experienced and respected consultants working on the project with us all the way through from design to maintenance. John Neylan and David Nickson provide feedback on the quality control aspects of the project and also will monitor the performance of the surface as we head into our 2 year maintenance contract. Bruce says that it has been an exciting project to be involved in and a milestone for Evergreen Turf to finally have ERS in Australia. 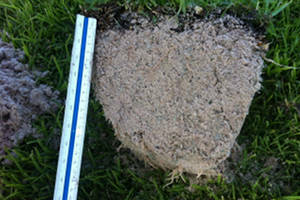 “Evergreen Turf has gone from being a domestic turf supplier to a constructor of major turf facilities. So, it has been really exciting to get this done and get it to the point we have now.